During a new implementation of Dynamics NAV (Navision), most Dynamics NAV (Navision) consultants understand how to load in A/R and A/P beginning balances. However, when it comes to bank beginning balance. The subject is usually more murky. On one hand, you need to put in the bank balance so it shows up on the bank ledger, on the other hand, if you put in just a lump sum, doing the first bank reconciliation will be a nightmare. 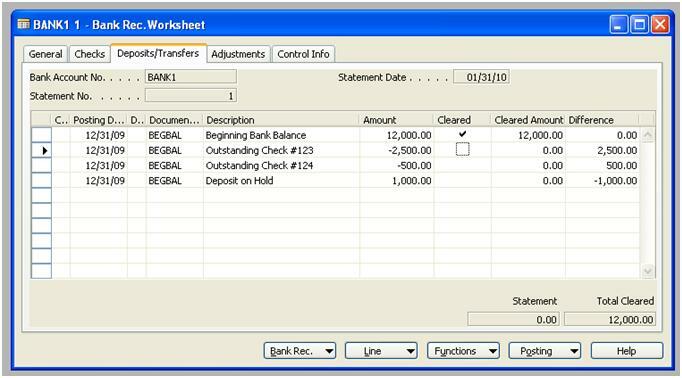 The goal when entering a beginning bank balance, is to update the bank ledger to ensure the amounts are correct. In addition, the bank transactions that are not cleared needs to be come up so it can be properly reconciled. In this example, we’re going to assume the Navision client is going live on 1/1/2010. First of all, the Dynamics NAV (Navision) client or the consultant needs to itemize what checks are outstanding (not cleared yet as of the 12/31/09 bank statement). We all know that to load in beginning G/L balance, we use the General Journal. We typically use loading of beginning balance as the same step as we load in the bank balance. While we load in the beginning balance, we set the Account Type as Bank Account. 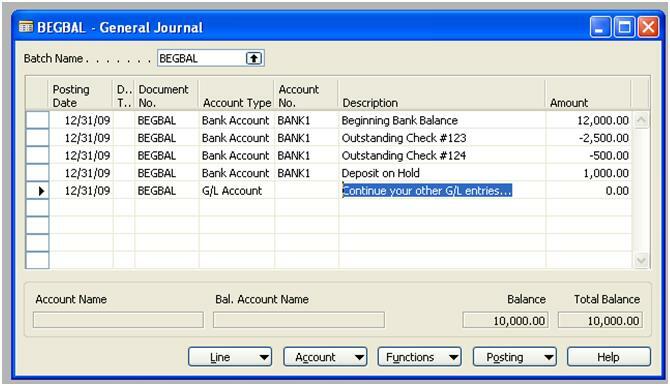 Doing this will automatically update the bank ledger and the G/L ledger based on your Bank Account Posting Group. Doing so, the transactions will match exactly to the bank statement and to the G/L. In conclusion, you can say that the bank beginning balance is the Bank Balance + Outstanding Checks – Deposits on hold.